You must make reservations at least 5 minutes in advance of the time at The French Gourmet. There's 15 minute parking in front of the bakery, and parking on nearby side streets. The parking lot adjacent to the building is available after 4pm on weekdays and all day on weekends. Also a versatile San Diego catering company, our products are all prepared fresh daily on the premises. The dishes conjured up in our kitchen reflect a commitment to originality, freshness and the celebration of taste. Our knowledgeable sales team will work with you to create a menu and style that will compliment your event and your budget. As a local catering company, we can provide you with china, glassware, place settings, equipment rentals, servers and bartenders, and much more. Our restaurant is available for private parties on Sunday and Monday evenings. We host large parties all the time in our restaurant even during regular service. Custom menus available. Consider us for your bridal shower, office holiday party or organization's meeting spot! Our restaurant serves California-influenced French cuisine in a quaint countryside environment. 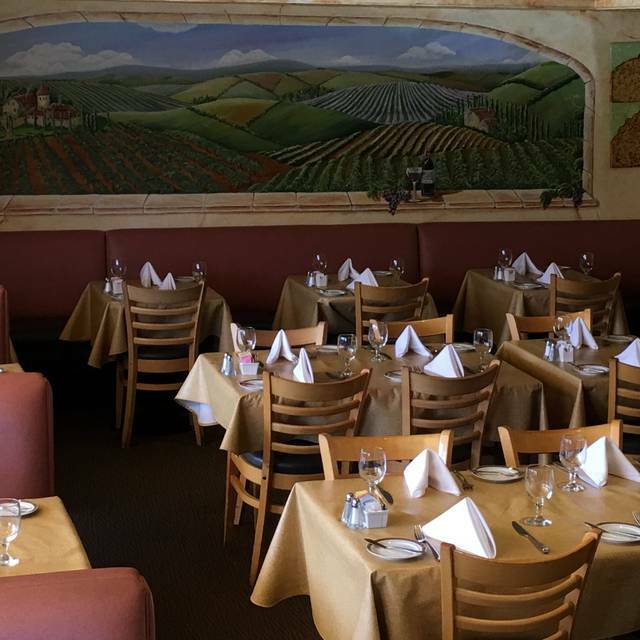 We are a long-time favorite of locals who appreciate the value of the menu and our extensive wine list. After more than three decades of serving our clients, it is as much an honor and a privilege, as it is a reassurance to know, that while culinary trends come and go, appreciation and dedication to quality endure. Breakfast and Lunch served daily; Dinner Tuesday-Saturday after 4pm. Early Bird Special: FREE appetizers and desert with 2 entrées! Between 4:00 pm and 5:30 pm purchase any two entrées and get a Soupe á L’onion Gratinée or Salade Maison for each entrée and any dessert to share! Our house wines and house martinis are on special for $5! We went here for Easter brunch with family. I had the French toast which was superb— fluffy brioche perfectly prepared with a side of bacon. My husband enjoyed a seafood crepe — another family member raved about the quiche. Just a delightful experience overall! We love going to the French Gourmet. The quality of the food is excellent and the service too. Very consistent. One of our favorite places to take out of town company. The service was really good and the food was delicious! We definitely be going back. We loved our experience. Don’t know why we waited so long to come. However, I’m not a fan of the large video screen advertising all your catering skills. It spoils the ambience for those facing the screen. I always enjoy my meal however, the last two times I was there they did not have my favorite dessert. Very disappointing. Napoleans are the best. They told me to call earlier in the day and have them set one aside for me. I will do that in the future. This place is amazing. From the moment walked in with great smiling employees. The food was really good and nice proportions. Nathan did an outstanding with his excellent knowledge of the menu and specials. Nathan was also a fabulous waiter for our table. First time and it won’t be the last we come for dining here. The dessert choices and tastes were so fresh and amazing presentation. Would recommend this place and can’t wait to be back. Thank you Nathan and other staff for the enjoyable experience. Fantastic food. What a great little gem in this neighborhood. 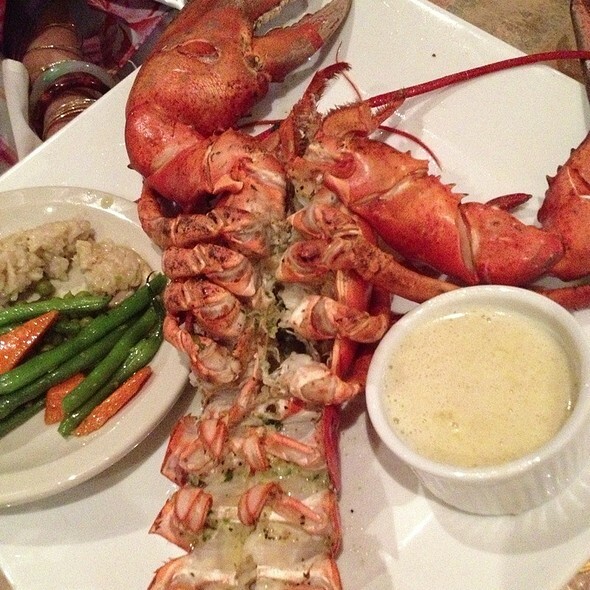 The food was excellent, the prices very reasonable, and the restaurant quiet and comfortable. Looking forward to my next visit. The French Gourmet never disappoints whether it is a drop in for morning coffee and breakfast to go or a nice dinner with the hubby. The French Gourmet is a must visit on every trip to San Diego. Their hollandaise is the real thing. And the bakery is first rate for treats back at hotel. 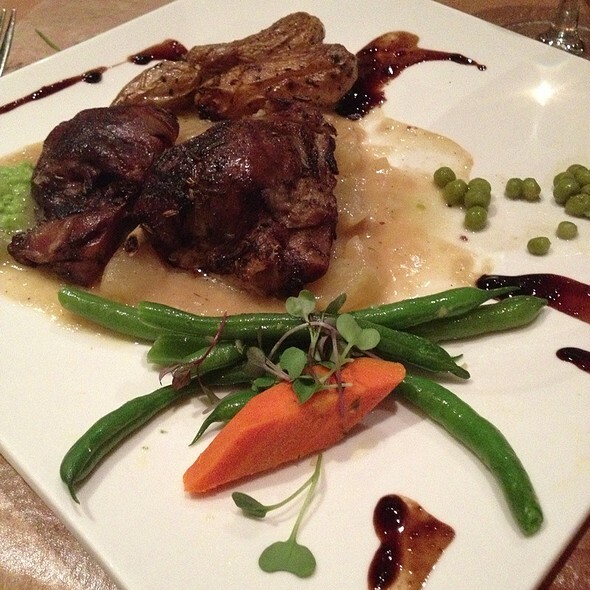 Friendly service, excellent food, great value in their prix fixe menu. Enjoyed it and will return. This is absolutely one of the best French restaurants in San Diego. My girlfriend and I ordered the seafood crepes and the California eggs benedict. Both were outstanding! 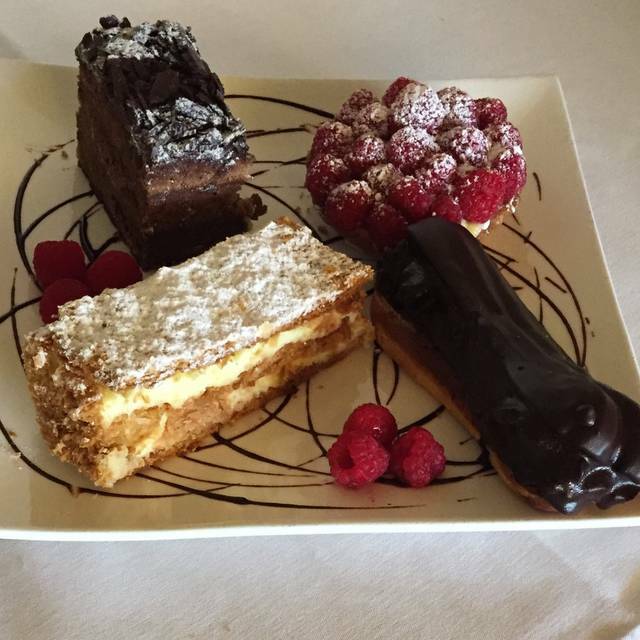 The wine list is extensive and the desserts are to die for! Will definitely be going again soon and recommend to anyone in the San Diego area or visiting. It's good. A little over-priced. And the one waiter was overworked. We were traveling and we’re so glad we discovered this gem. The food was fantastic! The service was outstanding! I had the Florentine Omelet and it was excellent. Fresh bread with butter and jam to start was great. Coffee was strong and flavourful. Breakfast potatoes were yummy. Farmers omelet, quiche, and sausage and eggs all excellent. We will go again! The small room is dominated by a well executed mural of provincial French wine country. My rack of lamb was excellent; done exactly medium rare, nice sauce and mustard crust. Spouce's chicken also quite good. Excellent value as well as quality. Food was wonderful. 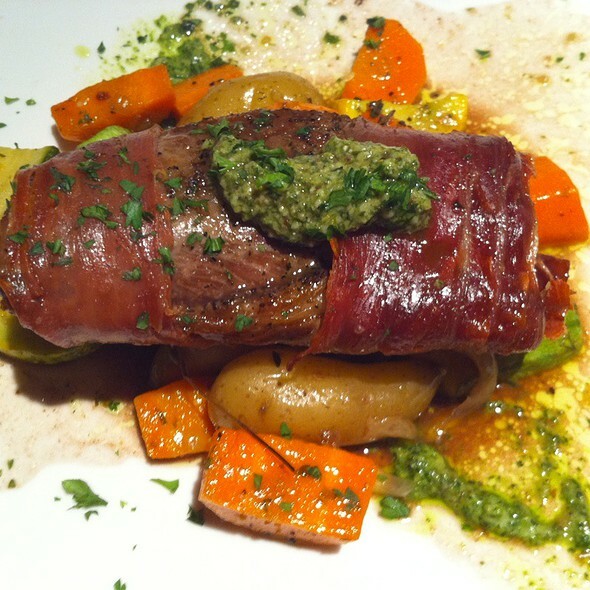 The pre fix menu was a great value, and the service was excellent. We will be going back. Absolutely delicious, as usual. Service was outstanding! Food is delicious, love the quaint ambiance. The bakery selection is outstanding. so many beautiful pastries to choose from. This is our place for French food. Usually an enjoyable meal at a reasonable price, if you take advantage of the specials they offer. The Roast Chicken was enjoyable. I would not recommend the Duck Confit, as it is overcooked an dry. This was the second time/chance I tasted it, and there won't be a third. The Filet Mignon with Bernaise sauce very good. Great service...delicious food! The French bread is amazing. The best I've found aside from being in France! Perfect place for us to dine!! They r so friendly!! 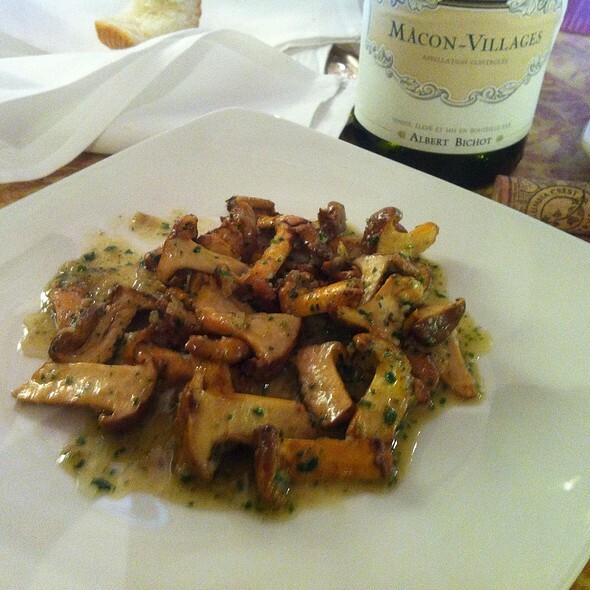 Quaint French bistro food off the beaten path. Food was excellent and service to match. French cuisine with a gourmet flavor. Very affordable. Prix fix 3 course is an amazing bargain. Entree specials are noteworthy. 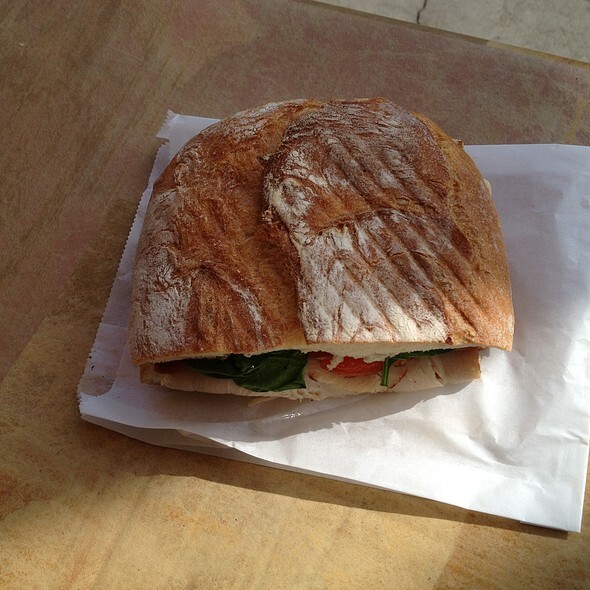 On premise bakery provides the French bread and pastries. Will definitely return to try the other menu items. Diamond in the rough honestly. We had a great Valentine's Day dinner here. We had to wait a bit despite our reservation, but that is understandable because it's a very small restaurant. The food was delicious, cooked perfectly, and we loved every bit of it, especially the pork belly, steak & lobster, and the duck. However, I was not expecting a prix fixe menu that night because it was not advertised on OpenTable nor the restaurant's own website. When choosing a Valentine's restaurant, I factor price into my decision and it helps to know how much each restaurant's prix fixe menu is going to cost per person ahead of time. One of the reasons I chose The French Gourmet over other restaurants was because it didn't appear to be serving an expensive prix fixe menu that night, until we got seated and I saw that the price per person was even higher than the other restaurant I chose not to book. Had I known ahead of time, I would have booked at the other restaurant. I didn't make any fuss about it because it was too late to change our minds and I didn't want to appear cheap, but I felt kind of side-swiped by that. Please make sure to advertise the Valentine's special menu on OpenTable and/or on your company website. It was probably worth the price considering the quality of the food and free glass of sparkling wine, but it was more than I had budgeted for that night. A very good experienc, as it has always been. We always enjoy the food, the wine & the excellent service. Delicious food, sensitive servers.. delightful evening. We starting going to The French Gourmet several years ago and continue to go back as it is a charming, inviting small space in which to enjoy great food and service! What a lovely and wonderful meal we had at The French Gourmet. The dining area is small and quiet. We were actually able to have great conversations! Our server could not have been better. He was able to answer our questions and take fantastic care of our table without being invasive. The food, oh man, it was outstanding. 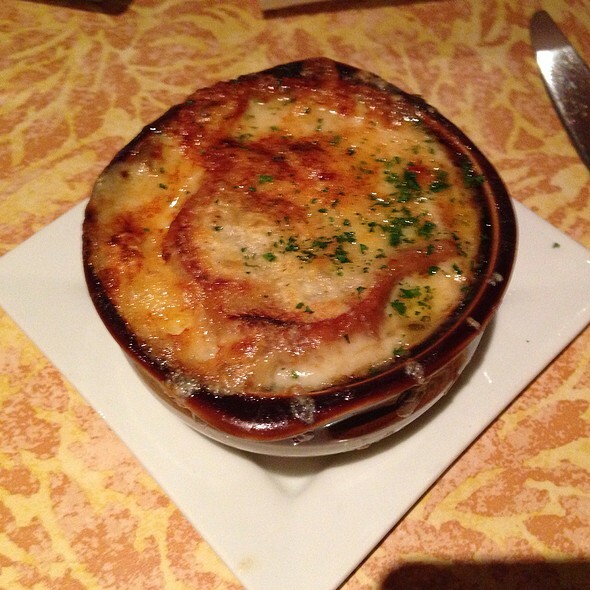 We were a group of 4 and we ordered the Onion soup and Escargot to start. BEST French Onion soup I have ever had! Not too salty with the perfect layer of cheese and bread. 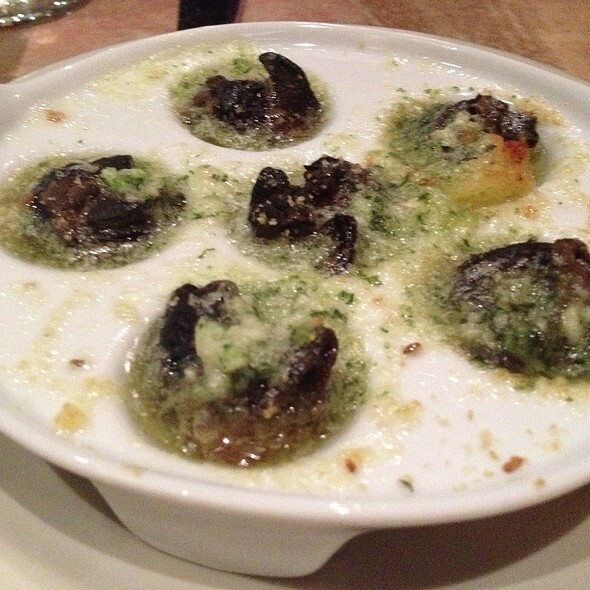 Must say, I did not have the Escargot, but the friends who did loved them! The bread is served warm with tasty butter, not waxy and frozen like most restaurants. I had the special Halibut which was moist and perfectly cooked over pearl couscous and veggies in a light sauce that was fabulous. Rack of lamb was also perfectly cooked and plentiful. Short Ribs looked great and friend loved his meal as well and husband had the Duck Leg Confit which was so yummy. PERFECT evening! No complaints or disappointments! We were too full for dessert but purchased croissants, cookie and a Palmier which was out of this world buttery and flaky. I cannot wait to go back! First time for this restaurant, I am impressed. Really lovely hommy food and environment, and their desert is perfect. I took my daughter for a date night dessert.. really good. Super friendly. Have been dining at The French Gourmet for many years and for the most part our experience has been excellent. However, on our last two visits, the experience was not up to their usual standards. On 24 Dec we had a longer wait than usual, and due too an “incident” in the kitchen our entrees were delayed quite a bit and others who arrived after us were served before us, with similar orders. This visit, during restaurant week, we were seated next to a larger group, who very very loud. Also noticed our entrees were somewhat smaller than others. Overall though, I guess it’s too much to expect perfection every time, so we definitely will continue to dine at The French Gourmet! From the moment we stepped into the restaurant, we were greeted with a smile, and also complimentary danish while waiting. Service was excellent, food was really good, and the right amount. Overall, it was an amazing experience. Amazing food, amazing service. Great place to go! Great food and service. The wine was also really good and a great value. Bought sone pastries and wine to enjoy later. Will definately reccomend and return. Intimate restaurant with excellent food and friendly, attentive service. Bakery items are fantastic too!